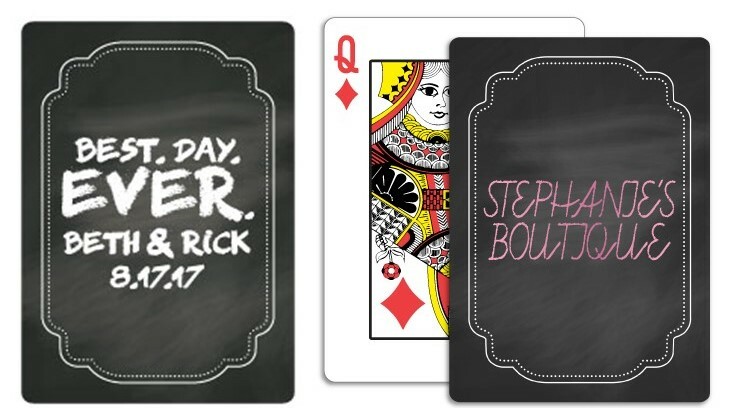 These unique Custom Playing Cards feature a Chalkboard design with your logo or custom text. Chalkboard cards are Poker Size (2-1/2" x 3-1/2") with Regular Index (i.e. standard sized numbers and pips) and come packaged in sturdy cardboard cellophane-window tuck boxes. Our line of Customized Playing Cards are all Made in the U.S.A. and are printed on high-quality, plastic coated playing card stock. Contact Us toll-free at 1-800-233-0828 today to order. Your satisfaction is guaranteed! Chalkboard: Poker Size – 1 Color Imprint $4.05 $3.95 1-5/8" 3/4"
T1-Tuck Box with cellophane window – Window size is 1-3/4" X 3"
Special Packaging is also available on request. Window size is 1-3/4" X 3"
It's easy to get started with your Money Theme Custom Playing Cards. Simply email your artwork in digital file format to graphics@kardwell.com. Then call 1-800-233-0828 to speak with a representative.